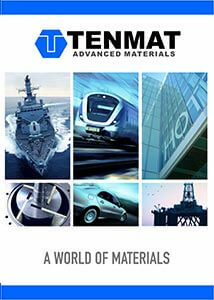 TENMAT is a leading manufacturer of advanced materials and components with over 100 years of experience. The diversified product range includes wear parts and bearings, engineering ceramics, high temperature resistant materials, hard metals, and passive fire protection solutions. The company’s headquarters is situated in Trafford Park Manchester UK where the first composite engineering components were created at the turn of the twentieth century. TENMAT provides its customers with advanced material solutions that ensure high performance and peace of mind in extremely demanding industrial applications and environments. The TENMAT group is a multinational corporation with presence in the United Kingdom, the United States of America, France, Germany, the Czech Republic and Italy as well as a global network of vendors and distributors. TENMAT is fully committed to technical excellence through heavy investment in ongoing research and development. TENMAT has extensive in-house technical resources to develop innovative and high quality products. Our unrivalled innovation and technical expertise has consistently led to the development of various industry standard products. TENMAT’s main focus is on extending the performance characteristics of existing product ranges and taking the company forward into totally new and exciting growth areas such as advanced passive fire protection materials and hard metals. To be one of the world’s leading companies in the manufacture and supply of differentiated high performance engineering materials and components. In order for TENMAT to achieve this objective our relationship with our customers is of paramount importance. Outstanding service, unsurpassed quality and a commitment to excellence are hallmarks of our Customer Service Department. TENMAT’s goal is to provide a complete service, from material selection to component delivery while developing a long term working relationships with our clients. Complete the form below to speak with a customer services representative or request a call back. I give consent to Tenmat to process my details through this form.